答：一个用于加载布局的系统服务，就是实例化与Layout XML文件对应的View对象，不能直接使用， 需要通过getLayoutInflater( )方法或getSystemService( )方法来获得与当前Context绑定的 LayoutInflater实例! ③是否为加载的布局文件的最外层套一层root布局，不设置该参数的话， 如果root不为null的话，则默认为true 如果root为null的话，attachToRoot就没有作用了! root不为null，attachToRoot为true的话，会在加载的布局文件最外层嵌套一层root布局; 为false的话，则root失去作用! 简单理解就是：是否为加载的布局添加一个root的外层容器~! throw new InflateException("merge can be used only with a valid "
To create a new LayoutInflater with an additional LayoutInflater.Factory for your own views, you can use cloneInContext(Context) to clone an existing ViewFactory, and then call setFactory(LayoutInflater.Factory) on it to include your Factory. Inflate a new view hierarchy from the specified xml resource. Throws InflateException if there is an error. 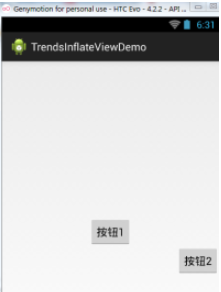 Inflate a view from an XML resource. 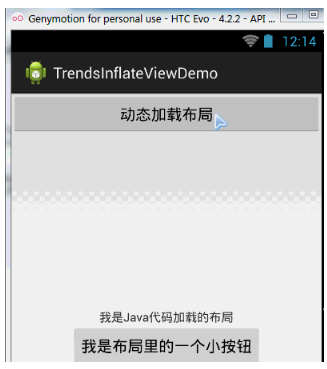 This convenience method wraps the LayoutInflater class, which provides a full range of options for view inflation.